Hospital Indemnity Insurance (HI) provides cash benefits for each day an employee is confined in a hospital or being treated in a medical facility for a covered illness or injury. Insureds can use these benefits to help safeguard against the expenses that medical insurance may not cover like co-pays, deductibles, or any other living expense that may arise. Hospital Indemnity Insurance can be a meaningful addition to any employer’s offered benefits. It is designed to help employers fill in the financial gaps left by most of today’s high-deductible health plans (HDHPs) or when employees choose not to carry major medical coverage. The average cost of an overnight hospital stay in 2014 was $5,250. That number is basically in line with the average maximum deductible per year as defined by the Affordable Care Act (ACA), which in 2017 is about $7,000. In other words, if you are admitted into the hospital, do you have a plan or the economic means to pay the costly deductible? What is Hospital Indemnity coverage? Hospital indemnity insurance is a type of supplemental insurance plan that can be added to an existing health insurance plan to help cover the costs of a hospital stay. It does not replace a health insurance plan. Like many other supplemental insurance plans, hospital indemnity insurance pays out a cash benefit directly to you. This type of plan pays you a predetermined benefit amount per day for each hospital admission, typically up to a year. Hospital indemnity insurance plans may cover inpatient hospital, intensive care unit (ICU) and critical care unit (CCU) admissions and stays. Some plans also cover outpatient surgery, ambulance transportation and continuous care expenses. What can benefit payouts be used for? Payouts are most often used to cover things like health insurance deductibles, copays, household bills and out-of-pocket costs. However, with this type of policy, benefit payouts are not tied to specific services, so you can use your benefit payout as you see fit. 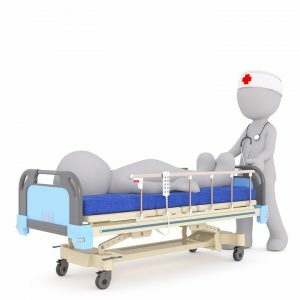 Are there dependent benefits for hospital indemnity insurance? In most cases, yes, it is possible to add dependents to a hospital indemnity insurance plan. Adding a dependent or spouse to a plan, if it is allowed, will most likely result in increased premiums. Are all hospital indemnity insurance plans the same? No. You have the ability to customize your plan so that it pays benefits out on maternity visits or ambulance rides, or so that it pays out increased benefits on intense ailments, like strokes or cancer. Adding these features, though, may result in higher premiums. Though every policy is different, there is generally a 30-day waiting period before benefits from this type of insurance can be used toward an illness that results in a hospital stay or intensive procedure. Is hospital indemnity insurance expensive? The monthly cost of hospital indemnity coverage varies depending on plan choice, age, gender and tobacco use. Premiums typically increase as policyholders age and add dependents to the plan. Generally speaking however, HI plans are priced with value in mind and most people find very affordable.